MMC-1105 maybe is an unprecedented brand new concept of digital wireless camera, which is digital totally from lens to RF output circuit. For real time wireless monitor use, its resolution can be HDTV 1280×1024; its definition is 3-10 times as the former microwaves wireless camera(CCD wireless camera, the maximum theoretic resolution is 720*576 or 760*480) and COFDM. If use it for low altitude aerial photography, 60-degree you can see clearly the brand name of the cigarette box on the ground don't need change the lens focus. For book photographing or evidence taking, at one time it can photograph clearly all the words on 2-3 A4-sized papers. The above-mentioned performance of MMC-1105 is beyond the normal PAL/NTSC videography equipment can do, including some of the equipments for broadcast use. Taking advantage of the most update 2.4GHz BroadWide™ RF blind-area compensable technology, the advanced technology MM-1105 takes has very good performance in signal transmission. Take basic specification of MMC-1105 as an example, the transmission power of it is only 17dBm(50mW), but its reference transmission distance can be more than 5KM. and MMC-1105S is 15KM. Comparably, to meet the above mentioned long transmission distance 15KM, the standard 8M-bandwidth CODFM or microwave equipments must need very high transmission power of above 1000mW. Additionally, MM-1105 has interfaces of voice input and output, data link and it is built in a 16G memory cell (optional). If necessary, you can use it for communication, transmit data with speed of <9600bit or record video of an extra 3 hours or so. A complete set of MMC-1105 system consists of a wireless camera host machine, MMC-1105-Center and a laptop computer (the laptop is prepared by yourself, the video memory of which must be more than 256M). The process of data transmission is: from host machine wirelessly transmit to MMC-1105-Center, and then wirelessly transmit to the laptop. From the above, we can see the three parts can be separated in different places. And the user doesn't need to stay with MMC-1105-Center; it can be independently put in high place. Switch on the power of host machine and MMC-1105-Center, through the laptop we can see a wireless network of MMC-1105-Center, which is an SSID calling sign from MMC-1105-Center. After switching on the host machine, there will be followed by a self-test for about 30 seconds. When the red light of the indicator turns into green, it still need above 45 seconds for the host machine to communicate with MMC-1105-Center. To use this system, you should first set the IP of WIRELESS NETWORK CONNECT as 192.168.0.X, the X must be among 0-255, but it cannot be 20. Olfaction-Detection. 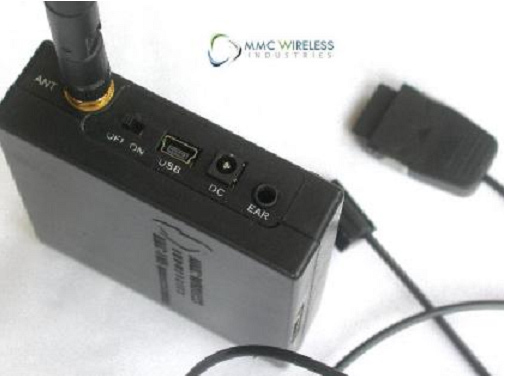 MMC-1105 can intelligently find out most of the public wireless networks around it. 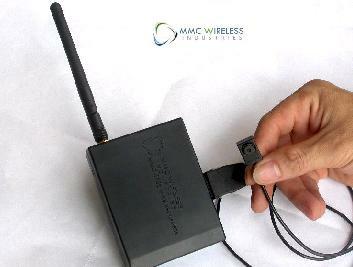 Such as WIFI hotspot and China-Net, don't need the username and password Through setting the parameters to match with the public wireless network, MMC-1105 can wireless transmit pictures through the stated wireless network. The process of data transmission is: from Camera wirelessly transmit to hotspot , and then wirelessly transmit to your laptop (Note: The signal receiving sensitivity of the external wireless LAN card is above 5~ 10 times as the built-in wireless LAN card.). In this mode, the MMC-1105 Center will be temporarily abandoned. The working environment between ground and air is very different. Though MMC-1105 takes advantage of the most update 2.4GHz BroadWide™ RF blind-area compensable technology, when there are barriers, its signals still will be declined to some extent. The key to control the decline within the acceptable range is to select a proper position to install MMC-1105 center (mainly for its antenna), which determines the result of the system in ground environment. MMC-1105 has great value in military & civil use. The main advantage of MMC-1105 is that, it can attain super high resolution of video image, which is 3-10 times more than previous micro wireless cameras. MMC-1105 can allow the user to see the very details in the picture screen. Such as if used for police for real-time monitoring, the high definition picture of real-time video and later-recall video will greatly help the police to attain importance evidences and to solve the cases successfully. The resolution of the general airborne video camera on the mini TUAV is very low. It only can allow the user to see the big objects or the objects in obvious positions, which will lose many valuable targets especially those fleeting targets. Therefore, to get better results, the users have to make the TUAV to fly back and forth many times to photograph the targets from different angles and in different times. For those unclear and unknown targets, the TUAV has to approach it close or reset the zoom lens to get better result. During war, it is difficult to get overall information of the enemy.